By joining the Holocaust Museum & Center for Tolerance and Education, you will personally ensure that this vital institution fulfills its mission to tell the stories of the millions lost, and serves as a tolerance and education center where new generations can learn firsthand from survivors of the Holocaust and the valuable lesson to help ensure a society devoid of hate. Museum membership is entirely tax deductible. For more information please contact the Museum at HolocaustRCC@gmail.com or 845-574-4099. 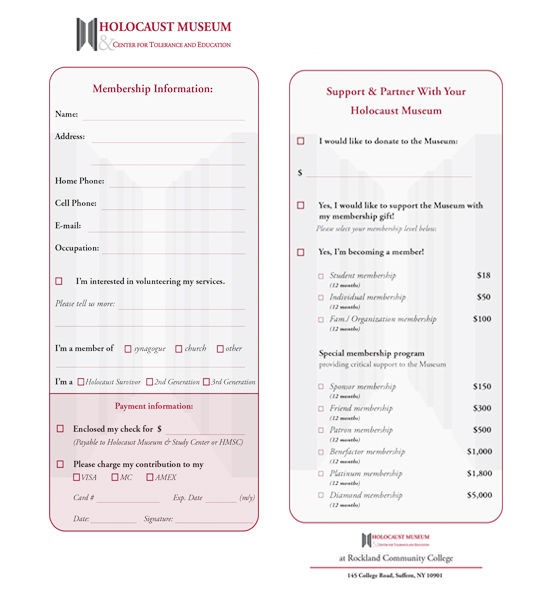 Click the membership form image for a printable version or select your membership level from the dropdown list and click the button below to become a member now.